The smartphone niche is destined to be seesaw battle. While the hot iPhone 6 Plus gains proud among Apple fans, Android phone geeks also give their thumbs for the new flagships including the Samsung Galaxy S6, HTC One M9 and Sony Xperia Z4 unveiled at MWC 2015. So how will they stack against with each other. Take a look at the full specs comparison in the Samsung Galaxy S6 vs HTC One M9 vs Sony Xperia Z4 battle and get a feel for how they differ. Display: The Samsung Galaxy S6 has again gone for a 5.1-inch SuperAMOLED display with 2K (1440x2560p) resolution and the highest pixel density in the market at 576ppi. And it makes no great difference between Samsung Galaxy S6 and HTC One M9 regarding to displays. Similar to Galaxy S6, HTC One M9 sports a slightly smaller 5-inch SuperLCD 3 display with 1080p resolution. However, Sony Xperia Z4 features a marginally larger screen at 5.2-inch, with a Full HD TRILUMINOS display. Compared with Sony Xperia Z4 and HTC One M9, Samsung Galaxy S6 demonstrates much more vivid images for watching, especially playing Ultra HD 4K videos. Video Watching Tips: In case you want to watch movies/videos/TV on mobile phones with no format restriction, MacX Video Converter Pro cuts the buck, helping you to convert video to Samsung Galaxy S6, HTC One M9, Sony Xperia Z4, iPhone 6/6 Plus and more with no quality loss. Storage: As far as memory concerned, Samsung Galaxy S6 loses out to HTC One M9 and Sony Xperia Z4. As we know, Samsung has been criticized for years due to its plastic design. But this new flagship is slim, lightweight and made of fine quality materials, to go head to head with iPhone 6, all at the cost of getting rid of the expandable memory option and the much-loved microSD card slot, which have been acknowledged to be the main difference between Samsung and Apple iPhone. While the One M9 and Sony Xperia 4, though available in 32GB/64GB option, have expandable memory options via microSD card (up to 128GB). This also the main difference in the Galaxy S6 vs HTC One M9 vs Sony Xperia Z4 battle. So in the field, the latter twos will still offer more storage compared with Galaxy S6. Battery: The Galaxy S6 is jam-packed with a smaller but sufficient 2550mAh battery as a result of Samsung's focus on efficiency while the One M9 houses a non-removable 2840mAh battery that gives us over 21 hours of talk time support on 3G. Sony Xperia Z4 whacks a non-removable Li-Ion 2330 mAh battery, which has the lowest battery capacity, compared with Samsung and HTC. Summary: So are you team Samsung, HTC or sony? 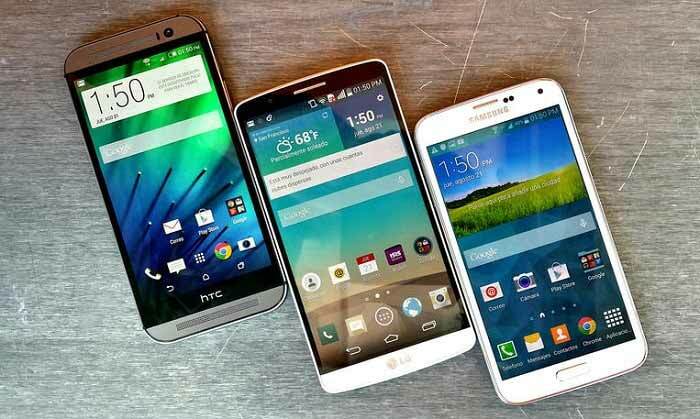 The Samsung Galaxy S6, HTC One M9 and Sony Xperia Z4 offer decent features. Some may appreciate the glass front and back on the thinner and lighter Galaxy S6, while others may prefer the One M9 and Xperia Z4, whether for HTC's luxury metal or higher battery capacity. What will be the best phones 2016 then? Whether you are going to take the Galaxy S6 home or pick the new One M9 or the Xperia Z4, these phablets will definitely offer you vivid image while playing videos. And if you are suffering from format incompatible issue while playing movies and videos on these smartphones, the following DVD ripper and video converter will be of great help. MacX Video Converter Pro is versed in converting SD/HD (4K included) to AVI, MP4, MOV, WMV, MPEG, etc as well as other Android supported formats for playing on Samsung Galaxy S6, HTC One M9, Sony Xperia Z4 and iPhone 6/6 Plus. Its hyper-thread technology and multi-core CPU help to deliver up to 83X converting speed while outputting videos with sharp images. The built-in YouTube download feature lets you download YouTube videos such as Big Bang Theory Season 8, Beyonce 7/11 music video, etc to iPhone, Samsung, HTC, Sony and other mobile devices in a few minutes. MacX Video Converter Pro is an all-in-one video converting program with top quality and fast speed. This feature-rich video converter can help you easily convert HD to Samsung Galaxy S6, HTC One M9, Sony Xperia Z4, iPhone 6/6 Plus and more.